…no, not another snow photo! I think most of us can see enough of the white stuff through our own windows today. In the interest of the Post a Day challenge, I’m pulling something from my own archives to post before then storm causes us to lose power and our internet connection. 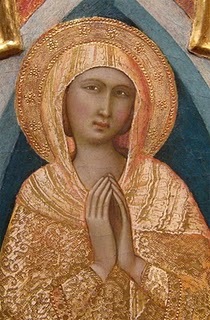 I wanted to look again at this image of the Virgin Mother, painted by Luca di Tommi in 1362 and posted last March by my friend Holly, on her blog. (She had just been to the Yale art gallery.) The colors are so rich. I love the glow inside the Madonna’s head covering, behind her neck. The teal blue behind her is the same color as the ocean here in the winter. 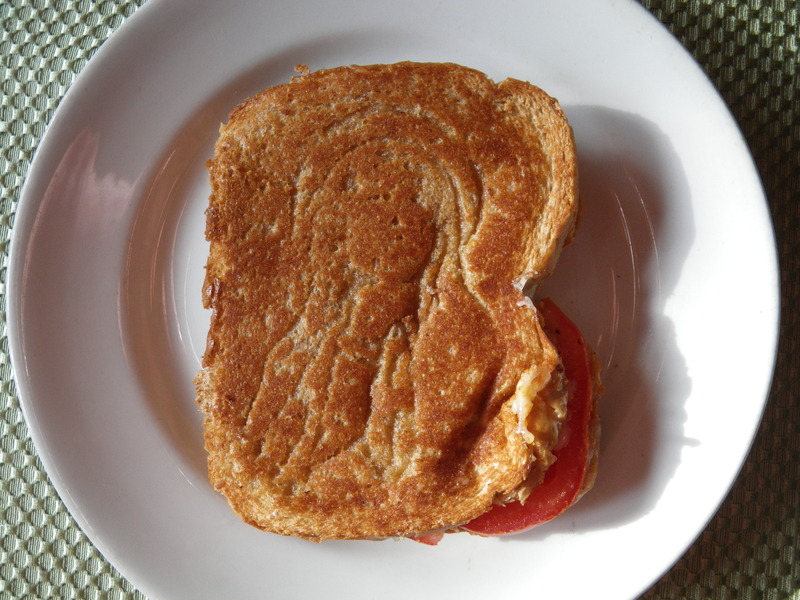 What also struck me on that day last March, was the shocking resemblance to the grilled cheese and tomato sandwich I was about to eat. I do love icons. This is beautiful and having a ‘divine’ grilled cheese sandwhich is certainly 2 post worthy. Eliza! How’s your summah down under? Did the pizza oven work out? Want me to send you some garden nuns? It was a pretty tasty sandwich. If it had been Elvis, I would have tried to sell it on eBay. Holy cheddar, batman! So how did the blizzard go up there? I am mortified that I have not sent you and Bruce a proper thank-you for including us in Ann’s lovely birthday dinner. You always make us feel welcome, sorry to leave, anxious to return. Stay warm! That was a fun night. We are in the Portland airport right now waiting for a flight to Baltimore to visit Robin and our future daughter-in-law, Stephanie. We were supposed to fly out yesterday….but were able to change flights twice to accommodate the weather. (!) I think we got about 15″ yesterday. Hope to get back to the island before the next storm next week.